It's time again for the Cupcake Project and Scoopalicious Ice Cream Cupcake Roundup - your opportunity to showcase your amazing ice cream cupcake creations just in time for Summer! For a brief tutorial to get you started, check out Stef's post on ice cream cupcakes. For tons of inspiration, check out the drool-worthy entries from 2008 and 2009. 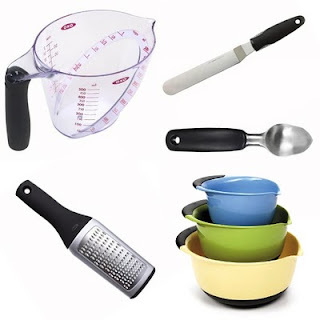 AND an incredible prize pack from OXO including OXO Good Grips Solid Stainless Steel Ice Cream Scoop , Oxo Good Grips 2-Cup Angled Measuring Cup , OXO Good Grips 1169600 3-Piece Mixing Bowl Set, Blue/Green/Yellow , Oxo Good Grips Bent Icing Knife , and Oxo Good Grips PRO Grater !! Two semifinalists and two voters will also win the OXO prize pack shown above. Read below for the complete rules. You'll be surprised to find out who is judging this year's contest. Dates: You can enter any time through May 31, 2010. Write a post on your blog during the month of May and include a link to both this post and to the post at Scoopalicious. (If you don't have a blog, you can still enter, but why not start one?) Sorry, we are allowing just one entry per person this year - so make it count! International readers are welcome to enter, but prizes can not be shipped internationally. You will win bragging rights and you will have the opportunity to gift your prizes to any person or organization in the United States. Upload a photo of your cupcake to our Flickr group. Please upload as large a photo as possible so that we can be sure to best showcase it in the roundup. Entrant Voting: All ice cream cupcake roundup entrants are required to vote for their favorite ice cream cupcake some time during the second week of June. Entrants must pick their first, second, and third favorite ice cream cupcakes and they are not allowed to vote for their own cupcakes. Entrants that do not vote will become ineligible to win. (To summarize - you are being judged by your cupcake creating peers - no pressure!) The top three cupcakes as chosen by the entrants will go on to the public vote. All three entrant-voted winners will win OXO prize packs, but the public will determine who wins the Cuisinart Ice Cream Maker. In the event of a tie, the cupcake that received the most second place votes will win. If there is still a tie, we will look at third place votes. If there is still a tie, we will have a quick - one day only - vote between the two tied cupcakes. Public Voting: Public voting will take place during the second half of June. Anyone with a valid email address will have an opportunity to choose their favorite of the top three cupcakes. You'll want to vote because two voters will win the same prize pack as the semi-finalists! In the event of a tie, we will have a quick - one day only - vote between the two tied cupcakes. 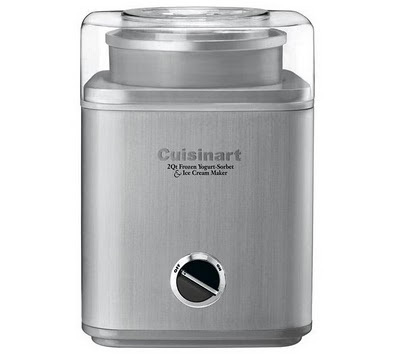 Special thanks to Cuisinart and OXO for offering our incredible prizes! A special thank you to Stef at the Cupcake Project for all her hard organizational work, her excellent description of the contest, and for procuring the prizes! Yes, I'm cutting this "Flavor of the Month" a bit close for making it into April, but I'm doing it! A couple of weeks ago I finally posted a review about some samples we got in the mail from Stone Ridge Creamery. Shortly after, there was a comment from "Lucky" asking why we had not yet reviewed Stone Ridge's Amy's Red Velvet Cake Ice Cream...why not? Because I didn't even know it existed. Well, Friday I stopped at Shaw's to pick some up and all I have to say is "Thank you, Lucky!" Oh, and "It's a good thing I am pregnant and due in August because these elastic waisted pants are serving more than my baby belly!" 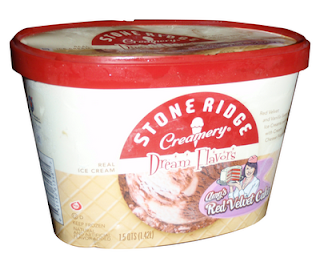 So I have a major complaint before I go into detail about how much I loved this ice cream -- if only the Stone Ridge Creamery website were even HALF as good as their ice cream. Their website is simply an image. You can't click on anything, you can't get more information. I suppose you could call Customer Service for more information at 1-877-932-7948, but picking up a phone and calling is so old school. If you think you can’t lick a prize like this one, ask three SUPERVALU® (NYSE: SVU) associates who were named the winners of the company’s employee “Stone Ridge Creamery® Name Your Dream Flavor Sweepstakes.” In addition to receiving free ice cream for a year and a $500 gift card, the winning associates will have their dream flavors added to the Stone Ridge Creamery lineup and their caricatures featured on the carton. Red Velvet Cake has long been a favorite family dessert for any celebration — from birthdays to weddings,” Youngblood said. “I also thought this flavor would be a great choice because Red Velvet Cake itself is a classic, nostalgic flavor that would be a natural addition to the retro feel of the Stone Ridge Creamery lineup. 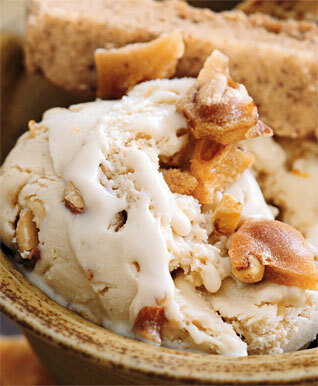 However, it still feels modern and innovative since it’s a flavor not commonly found in ice cream. Amy, I love your retro with a contemporary feel! Flavorwise, I found this ice cream to be very rich and creamy and the carton was polished off long before this post was finished. I loved the swirls of vanilla ice cream in the chocolate, but more than Red Velvet Cake, this ice cream actually reminded me of Hoodsie Cups I loved so much as a kid. Who am I kidding? I still love them! Haha! Anyway, this ice cream takes me back to elementary school when on a hot day we'd be surprised with the personal cups of creamy goodness and our own little wooden paddle spoon! Back to the product at hand, though. 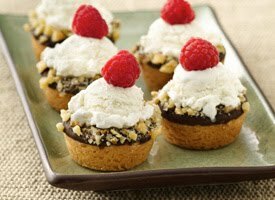 I find this dessert to be the adult version of Hoodsie Cups -- comforting and wonderfully tasty. The packaging is fun as well, with Retro Amy holding a huge red velvet cake. My one complaint is that I didn't LOVE how the cream cheese swirls didn't swirl so well into the ice cream -- it seemed to be more of an afterthought you were left over with rather than being so well integrated with the ice cream. It acted like a mix-in rather than a swirl that melted with the ice cream on your tongue. But that certainly wouldn't be enough to keep me from buying it again! Congrats Joe and Tom! Can't wait to try, especially if they are as tasty as Amy's dream ice cream! Visit your nearest Carvel today for some free low fat ice cream. We'll try to get out there for a review as well, but if we don't make it, we'd love comments as to how it is! Oh how I love my new iMac and the Epicurious Widget! So I plugged in ice cream and this is what I got for you. Enjoy! One reviewer says..."I've made this twice already and think it's one of the best ice cream recipes I've seen in a while. Very easy to make and freezes beautifully. The flavor is very similar to butterscotch." Don't forget -- Free Maggie Moo's Pizza Today! For all of you who are celebrating tax season being over (except for you MA residents in the 7 counties who got an extension due to our "state of emergency" a couple of weeks ago) -- don't forget to visit Maggie Moo's for your Ice Cream Pizza today! Tina wrote this up in more detail here. So glad I decided to catch up on my DVRd Oprah show because today's show announced the $1 million winner and one of the finalists had to do with our favorite thing, ice cream! So she starts the show off announcing the finalists then randomly the show goes into Richard Bronson's ridiculous life and back to the big announcement. Sort of odd..you think the entire show would have been about baking or something somewhat related. Anywho, Bronson lives the high life we all now know but let's get onto the good stuff...show us the winner! There were four finalists all in a different category. Drum roll please......and the winner is the Mini Ice Cream Cookie Cups! Congrats to Jersey's own Sue Compton on this awesome looking ice cream treat. These totally remind me of our Ice Cream Cupcake Roundup and I have a feeling some of the entries could blow this Pillsbury recipe away (no disrespect Sue..but we had some amazing stuff going on here!) but fair to say Sue's Mini Ice Cream Cookie Cups look pretty darn good. $1 million good! Definitely worth a try! Sue if you are out there...feel free to change up your recipe to be Mini Ice Cream Cupcakes and join us in this year's Ice Cream Cupcake roundup to be announced soon. Stay tuned! Sarah of Cooker Girl is going to make her parents extra happy when she goes home to visit them and brings them Perry's Ice Cream with the coupons she won by telling us about her favorite Perry's Flavor, which was quite a decision after seeing all the flavors Perry's offers. She says it's Mint Ting-A-Ling, but will she be saying something different after trying their new gelato? Be sure to check out Sarah's blog for some yummy looking recipes! Hmmmm..cars and ice cream. Looks like the people over at Lexus understand the true meaning of premium on and off the road. They took a test run in their online magazine to fill us all in on the Cream de la Creme...best in class frozen treats all over the US and we're loving it. It's always great to see and hear about hot spots all over the country. We're in our little world here in New England and tend to travel out of our circle every now and then but getting some other inside scoops is always nice. I love how they put it...premium ice cream demands loyalty. That is so true. If you are a true ice cream aficianado you understand that premium is worth every calorie and you stay true to it (but don't over due it!). You might veer off the road once in awhile to test drive others but then loyalty kicks in. Oh Ben & Jerry how I love you! Check out Lexus's road trip, Cream de la Creme and check out our little sneak peak. Who knew Laguna Beach, CA has more gelato stores than ice cream shops. 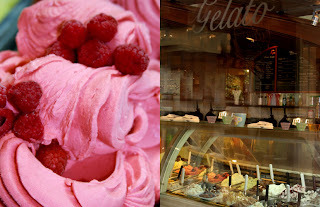 And did you know Gelato is characterized by its low overrun(less air!) and is made with milk instead of cream. 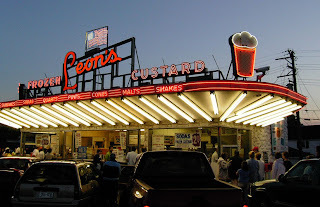 In the area..check out Tutto Amore or Gelato Paradiso for some "authentic italian"
Our friends in Milwaukee WI are all about frozen custard over at the 68 year old drive-in shop, Leon's. Their classic....the Rainbow Cone which Scoopalicious dished about awhile back is a tower of ice cream like none other. Thanks Lexus for giving us the road trip around the country to icy cool hot spots! 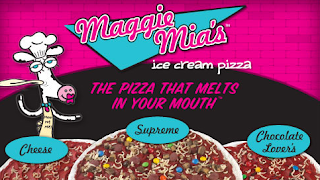 Maggie Moo goes italian...its Maggie Mia's Ice Cream Pizza. Too cute and sounds way too good. Oh and way too FREE this tax day, April 15th. To get Maggie Moo's “E-cone-omic” Relief, go check out a participating treatery on tax day from 3-7pm and enjoy a free slice of this new, one-of-a-kind pizza. Just in case you're curious as to exactly what this new ice cream pizza stuff is....picture a pizza (flat circle) with toppings. But instead of it being gooey and savory..its smooth and sweet. Check out the flavors and if you want you can even customize your own. so this calls for a celebration. I know where I'm heading on tax day. Happy Easter Ice Cream Treats! 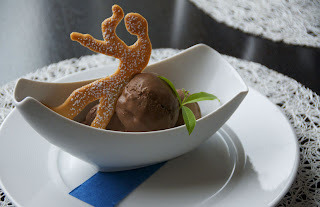 Yay Easter...a fun excuse to bake, make ice cream, eat chocolate, and just do something springy and fun. Of course I, like most, have my go to recipes but now that my little girl is five she wants to make things all by herself and Mom's boring cheesecake isn't it. It's usually some plain old cookies with the most decorations anyone could ask for. So this Easter I thought hmmm...what can we make besides Mom's same old go to recipes (not boring to Mom though!) oh and since its supposed to be 70 degrees on Easter here in New England (yippee for Mother Nature!) ice cream might just not be a bad idea. 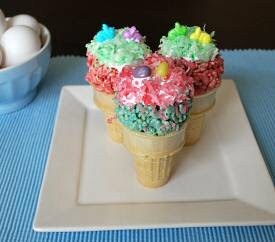 Check out these frosty Easter treats...just might change your mind from making carrot cake...again! Thanks Easter Bunny...bahhhk bahhhk.....HAPPY EASTER!!!!! "Dear ______, We have a a problem here, don't we? I know I was supposed to wait for Tina, but I stole a taste of the cannoli and I LOVE it...but I don't think we can get it in the MA area, can we?! OMG, this is NOT good!..." Perry's Cannoli Gelato may be on my list of all time favorite ice creams and as with all Perry's Ice Cream treats, it can only be found in New York state. I have been sitting here for about five minutes trying to figure out to explain it. I can't. Let's just say it's way up there with the best and most authentic cannoli I have had on this side of the Atlantic (mind you, I have never been to Italy, so I'm only counting this side of the Atlantic)...those from Modern Pastry in Boston's North End. The gelato is sweet, creamy, with just the right amount of chocolate chips. 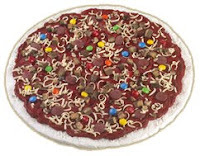 It's sitting in my freezer right now and it's everything I can do to keep from eating it -- I don't want to destroy my friendship with Tina by not sharing, so I am holding off! The other flavors were good as well, but it is the Cannoli I am constantly craving. The Wild Berry was the least of my favorites, at least in texture. The flavor was very good -- a fruity contrast to all the rich other flavors was a nice break. However, like many fruit ice creams/gelatos, the berry chunks were icy, but I have come to learn that this is kind of the nature of naturally made fruity frozen treats. The Tahitian Vanilla and Pistachio were both good as well -- creamy, and rich and admittedly, even for someone like me who often over does it on frozen treats, both were very good and quite enough in small quantities due to their richness! The Tahitian Vanilla actually reminded me of butter cream frosting, of which I am a big fan...oooh, it's kind of like they managed to turn butter cream frosting into ice cream, without the extreme density of buttercream frosting. The Pistachio was the most pistachio flavored ice cream I have ever had. Did you know many of the recipes for pistachio ice cream actually flavor the base with almond flavoring? This definitely was more pistachio than almond, and as much as I love almond-flavored pistachio ice cream, this pistachio-flavored pistachio ice cream. I'm packing our bags. 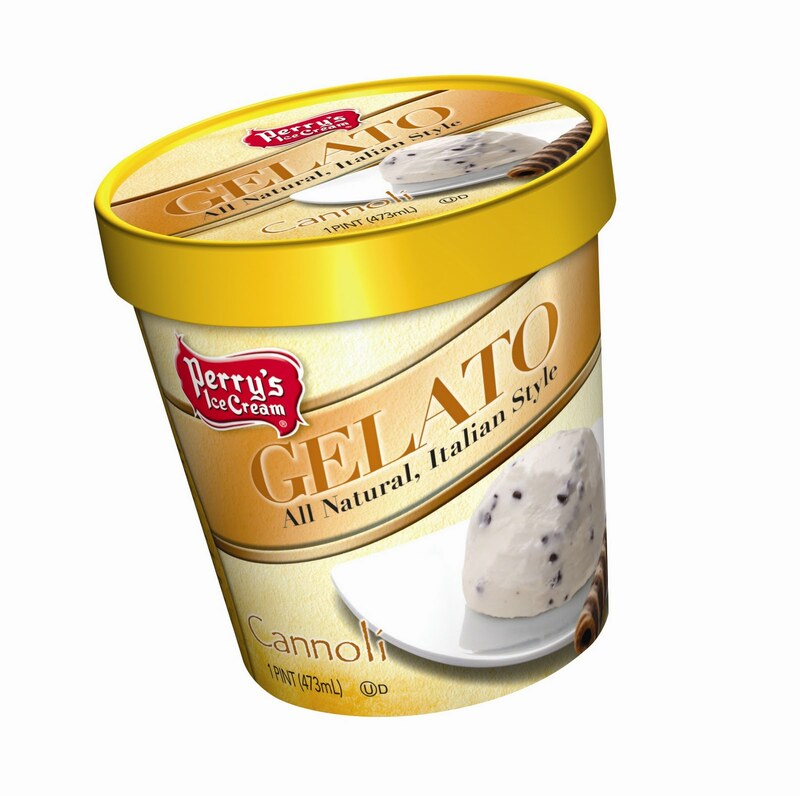 Someone please let Husband know we are moving to New York so we can get Perry's Gelato. Mike Brown, Perry's Product Manager, shows us how to best enjoy Perry's gelato...but honestly, with these rich flavors, who can let the carton sit on the counter for five whole minutes to soften just a bit? Um, I can't! What really stands out about Perry's is that it is all natural and you can tell. The flavors are fresh and definitely not artificial tasting. This sample certainly was a tease since it is truly wonderful and very inaccessible to us in the Boston area. New Yorkers/Pennsylvanians who have access to Perry's: I have some coupons! Let us know (by Friday, April 9, noon EST) what your favorite Perry's flavor is in the comments form (be sure there is a way to contact you) and we'll choose some readers to get some coupons in the mail!